I was doing a little research about the problem I've been having with pain in the second metatarsal head. 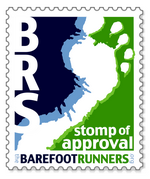 I was so happy to find a discussion about Morton's Foot on Barefoot Ken Bob's web site, The Running Barefoot. I have read stuff on Barefoot Ken Bob's "The Running Barefoot" page before and always learned a lot, but I have to admit the format is a little confusing to me. It looks kind of like a blog, but different people write the posts, so it comes across kind of like a message discussion board too. But after having found this information about Morton's Foot there, I'm going to work a little harder to dig out the information that is over there, as it all seems to be very good. I shall also add Barefoot Ken Bob's link to my list of blogs over on the side. The pain on this metatarsal is one of the main reasons, as I've mentioned before, that I have been holding back from increasing my distance. They have been having a big discussion about this issue, which you can read yourself on the link above, and I've learned a little something about it. For one thing, it sounds like I will be able to continue to run barefoot with this condition, and that good form (whatever my own personal good form is) and running on more gravelly surfaces (where will I find that?) will be able to help a lot. In the discussion, they link to a page from the Trigger Point Therapy Work Book on line called Self Treatment for Morton's Foot, even though another commenter on the thread known as "Footdoc, mentioned below, thinks the information is not 100% accurate. Yet the drawings on the page are helpful, and I think the idea of what is going on with this longer second metatarsal is sketched out enough to illustrate the nature of what might be happening. As a matter of fact, by trying to compensate for landing on this longer second metatarsal, it may be that I am turning the foot in or out, which could also explain the pain on the outer side of my left foot. Besides turning to ease the pressure on the second metatarsal, I also had a habit of turning because I was told I was a pronator (when a running store guy saw how worn down the insides of my old shoes were) and I from then on purchased running shoes built up with super-strong scientific spongy material that would resist breaking down and prevent me from leaning the foot in, which psychologically cause me to lean toward the outside even more. Furthermore, if this part of the article form the Trigger Point Workbook is true, it could even be possible that the plantar fasciitis I suffered from last year was really pain from a trigger point caused by this condition while I ran in my shoes. Another poster who calls himself "Footdoc" responded and said that this longer second metatarsal should not necessarily be considered an abnormality because it is commonly seen. "Footdoc" suggests that each person has a running form that is "right" for that person. In fact, "Footdoc" posts a link to a discussion on a podiatric message board which shows some fascinating pictures of a foot and where the load is distributed on the metatarsals based on whether the person is running in low gear and high gear. You might want to check it out here. I was encouraged by some of the suggestions that focusing on the mid-foot strike, relaxing the feet and ankles, keeping knees springy, etc.. can all help. I have additionally surmised that weight reduction on my part would also help. All in all I am very happy to have found an "answer" to the mysterious sore spot and I look forward to experimenting with better form to help improve the condition. Doing some homework I see. I think this is your most barefooterish post yet. Use the search on Ken Bob's site. It can be tough to navigate, but there's always something interesting. they get off-topic, and there's a lot of woo-woo, but everyone's friendly and quick to help out. it is likely to crack. This normally occurs in healthy and fit individuals who subject their body to excess physical activities. This kind of fracture is normally experienced by sportspersons and military recruits who engage in physical activities for long periods of time. They develop a stress fracture that leads to foot pain. The second situation is where people have extremely weak bones. This commonly affects women with osteoporosis.